Ongoing posts about my life. Today we decided to make chicken pot pies. The only part we didn’t do from scratch is the poached chicken; we used a roast chicken from Save on Foods. P helped chop up the chicken into perfect sized pieces, J cut the vegetables, and I made the scrumptious, deliciously flaky “basic pie crust”. 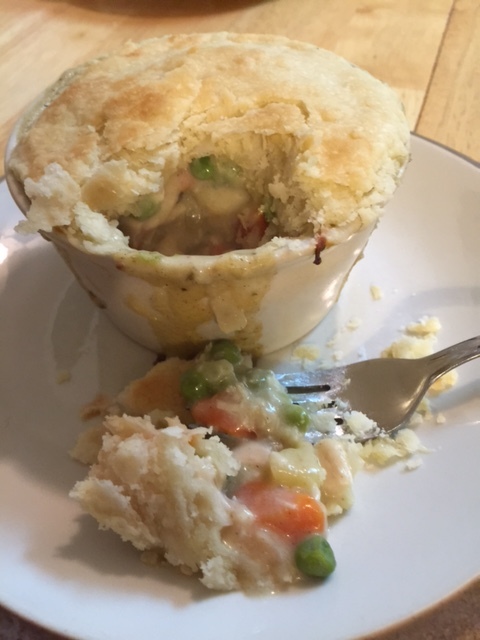 We followed the recipe from the Joy of Cooking, which alone is quite a feat as you need to use a total of 3 recipes to complete the chicken pot pie one! P.S. A while back I bought P her own chopping knife; it’s similar to one I had when I worked at the clinic, however this one is specifically for cutting lettuce. It’s a serrated, plastic knife that is “sharp” enough to cut hard veggies, and not sharp to the touch; you could cut yourself with a sawing motion but not by just pressing down on the knife. She loves it and has chopped carrots, potatoes, apples and chicken to help with food prep. i definitely recommending getting one for your preschooler! We also made a ninth dish which was about twice as big as these 7 ounce ramekins. My little baby is 11 months old! And very able to let her needs, and wants, be apparent to all observers. She has 10 signs, 1 clear word (mama) and 3 word approximations: “baaww” = ball, “maaww” = more and “miiL” = milk. And is learning a new sign once a day; she is only limited by the fact that her family doesn’t know anymore signs! A month into my sleep training expedition with Bree, (my own awkward compilation of Dr Jay Gordon’s “Sleep, changing patterns in the family” and Dana Obleman’s Sleep Sense Program), she squeezed my heart, again. This time at 2:38 am this morning. As usual, she went to bed last night in her crib awake, after our set routine, and was asleep by 8 pm. She woke at midnight first, and was soothed at about a medium rate; not quickly but not too stubbornly either. Then she woke at 2:38. I picked her up to soothe her with quiet singing, and “sshhh, nigh-nights”. But she had another idea. She said “mama”, patted my chest and said “Mmmi-LL” while very clearly signing ‘milk’. Then she said it again “mmmi-LL” and signed again. My heart melted and I acknowledged that I knew what she meant; then I nursed her. For a few minutes, and not back to sleep. I couldn’t ignore her sudden vocal accomplishment, and it was worth a slight set back (I have set her morning nursing time for about 4 am). Let’s see what tonight brings! But now I am prepared. I will lovingly, and clearly respond with “all-done milk; nigh-nights”, then continue to cuddle and soothe her as best as I can until it’s milk and cuddle time on my bed. Now we are off to the library to pick up 2 signing books so we can all learn more together! Little B is growing so fast! AlwaysREarranging … · …my thoughts, photos and furniture. Enjoy!